Head on over to Julia's Blog...Pontifications of a Twin Mom to see what other Mama's are loving this week! I have a deep rooted fear of the dentist but it always brings good laughs when I do FINALLY make an appointment, get knocked out and the aftermath of it all. Seriously...need a little "pick me up" or a straight out belly-laugh today? Check it out. 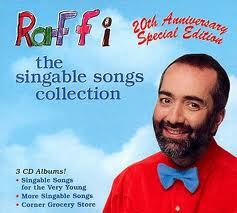 Back to the source of my "Love" today, Raffi. We've changed the words to the verses and ours go like this because we never really thought of actually learning the real words. Hey! What can I say? We like to sing to the beat of our drum. Mama LOVES Good Oral Hygiene & Raffi! I love it when the kids remind me it's teeth brushing time, makes me feel like an awful Mom for not remembering.....I really try hard to make sure we take good care of their teeth, it's too expensive as it is with twins, nevermind having to pay for all sorts of dental work down the line!! What a cool idea to have a song that reminds your kids about brushing. I agree with Kim above, I always feel like an awful Mom if a forget to remind them to brush their teeth before bed.